The Pages section of the Knack builder is where you add visual elements, or Views, to work with your records. Views are collected onto Pages. Your users will begin on a start page and can navigate to other pages in order to access different views. Each page can have one or more views. Once you add a new page, you can begin adding views to your pages. Click here for more information on adding and editing pages in your app. Your interface begins with an empty start page. This is the first thing your users will see. Click here for more information on adding and editing views. At the top is a Page Menu. This is a special menu that will display a link to each parent page, like your "Dashboard" page. You can control options for this menu by clicking the "Settings" icon link in the very top menu of your builder, then selecting the "Layout & Colors" tab. Directly above the table is a link to "Add Company." This is a Menu View linking to a child page. On that page is a form to add a new company record. 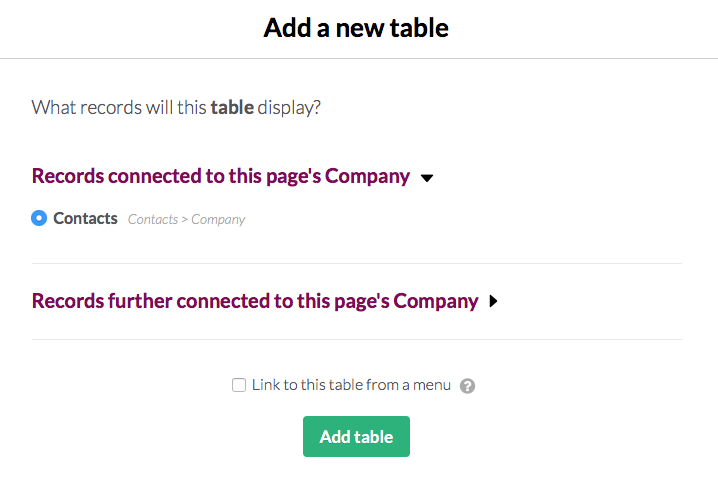 In the table, itself is a Link Field to "view more details." Each of these links goes to a child page that displays more details about a specific company record. This is useful if you don't want to show every field as a table column, or show records connected to the company (see below). Click here for more information on logins and registrations. With Knack, you can easily connect records. For example, you can set up your database so each Contact record is connected to a Company record. Knack knows that Contacts are connected to Companies, so you have the option of displaying those connected records with a view. Click here to learn more about connecting records in views.